It’s hard to believe the social fixture Instagram is only six years old. In 2012 it was bought for 1 billion dollars by Facebook, which explains the ads that seem know everything about you on Facebook and Instagram. Just four years ago this company was comprised of only 11 employees, and now Instagram has over 300 million users, with the number of #selfies growing exponentially by the day. Gone are the days when Instagram was full of coffee cups and vacation pics. It has been taken to a whole new level in recent years, allowing users to promote their brands and engage customers like never before. 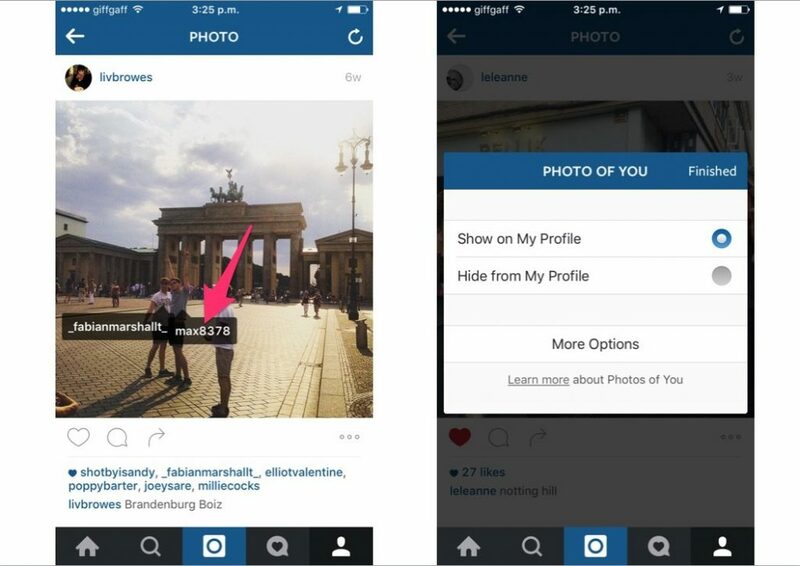 Instagram has tons of hidden features, tricks, and shortcuts that most users don’t know exist. If you’d like to learn how to maximize your Instagram potential, we’re going to walk you through 16 Instagram hacks you probably don’t even know about. With pCloud, you can backup your Instagram photos in case you want to discontinue your account or just be sure you will not lose them. If you set up your Instagram account three years ago, plugged your company website into the biofield, and have since let it gather dust, you’re missing out on a great way to reach followers. Though Instagram doesn’t allow you to insert links in your posts (unless your followers are the kind of people who are willing to take the time to copy and paste links), you can have a link in your profile. 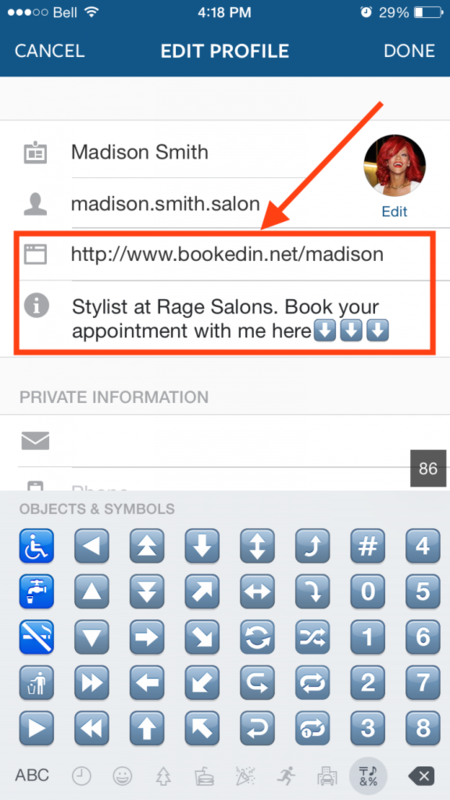 Utilize this social media marketing trick by changing your bio link as often as you’d like. Create a link with a link shortener like Bitly, put it in your bio, promote said link in your Instagram post, and you’ll see traffic pour in. 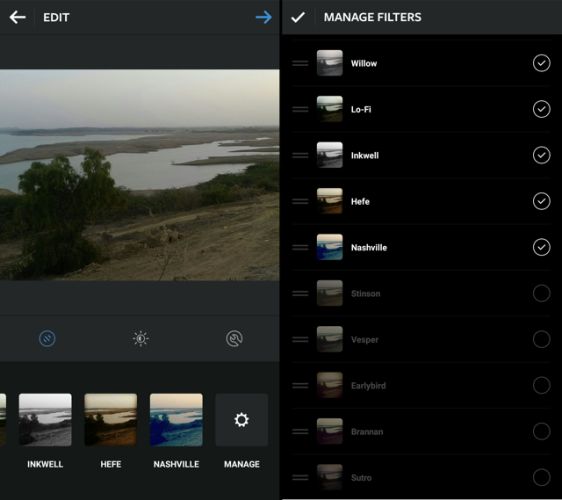 If you’re an avid Instagram user chances are you have a couple go-to filters. Rather than having to scroll through all the others you can reorder the filters so that the ones you use frequently will be at the top. You can even hide the ones you don’t use. To reorder, tap the three gray lines to the left of a filter and drag it up or down. To hide filters, tap the white checkmark to the left of the filter. When you’re through making changes, tap the check at the top right of the screen. 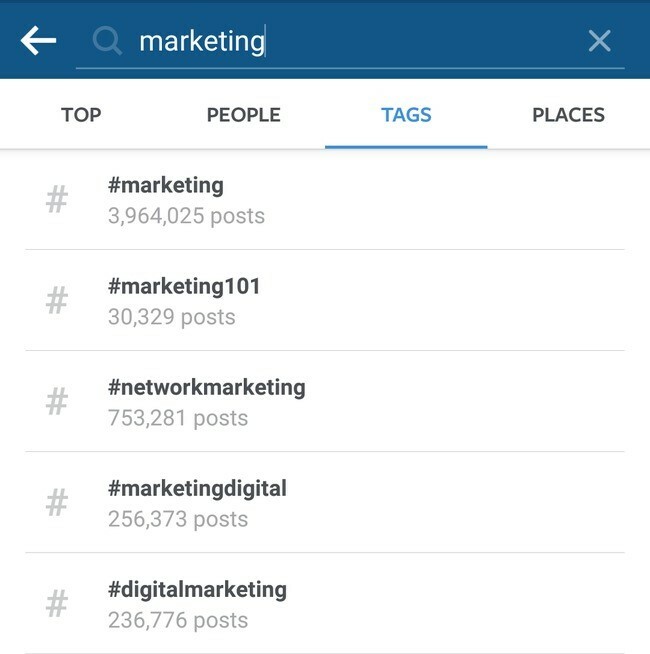 One trick for gaining momentum with your audience is by choosing a unique hashtag that will be associated with your brand. Don’t make the mistake of strictly using it on photos. Use it on fliers, the radio, emails, etc. This is a way to engage followers and simultaneously build a following. Want to check out a user without accidentally liking a photo from March of 2014 and totally giving yourself away? Don’t want to miss a photo one of your favorite people posts? You can turn on notifications for that user. Visit the user’s profile and open one of their posts. Tap on the three dots at the top right corner of the screen and tap “Turn On Post Notifications”. 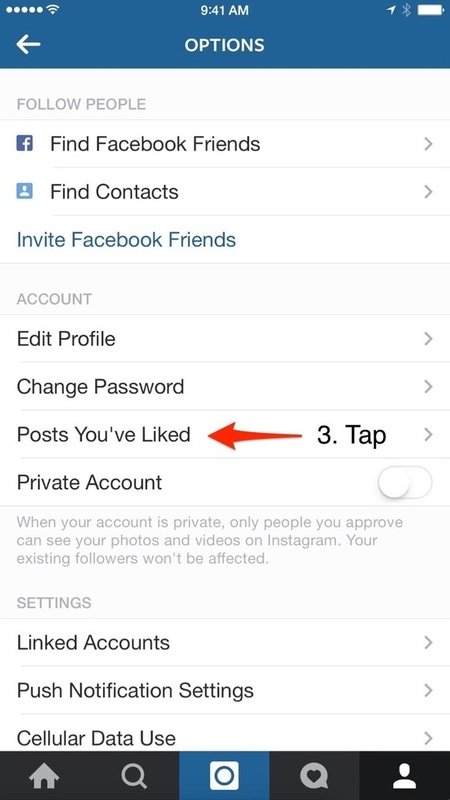 If you do this and are still not receiving notifications, make sure you’ve allowed Instagram notifications in your phone Settings. Follow the same steps to stop receiving notifications. A sure-fire way to increase follows is by piggy-backing. Find companies and people in your field or realm. Identify users who follow them. Follow a user. Then comment on a photo of theirs and like a different photo. You’d be surprised by how many people will follow you in return. This is an easy hack for increasing your followers. 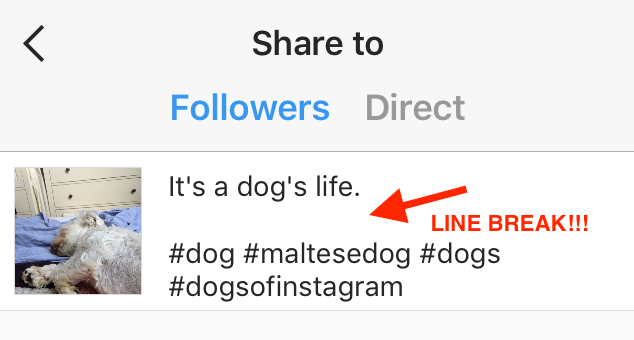 After Instagram’s update in May 2016, previous hacks for inserting lines and breaks in the bio or caption no longer work. But there is still a way to break up your content with page breaks. 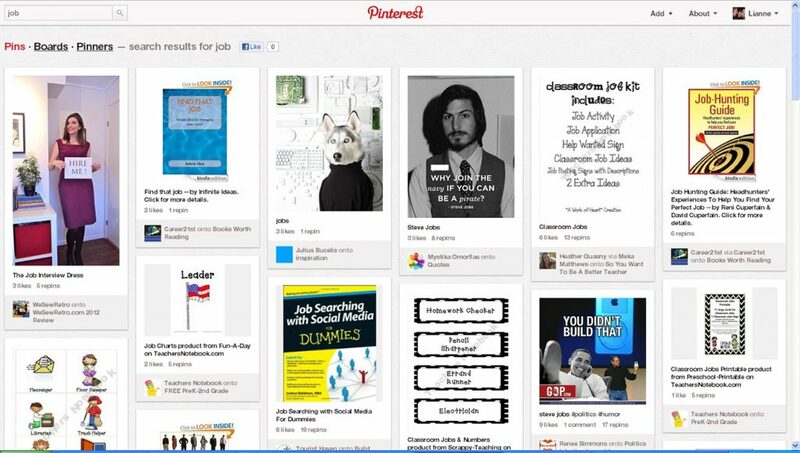 Draft your post, and insert a line of underscores where you want your break. For “Return” to show up on your keyboard tap “123”. Where is the demand if everyone has access to something? 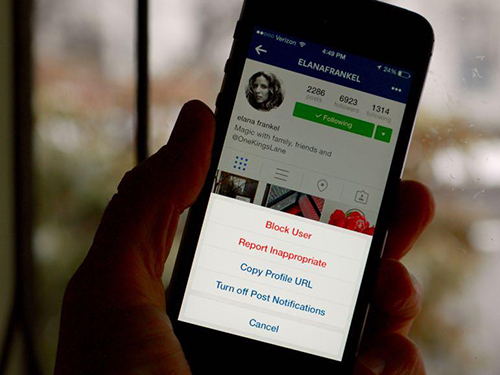 One tip we highly recommend is funneling people from all your social media platforms to Instagram. 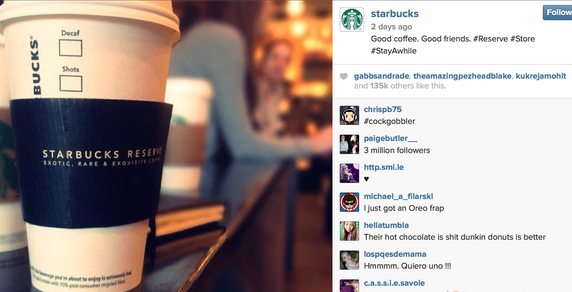 Make it clear that you’re going to have offers, tips, and new information only on Instagram. Followers will storm the gates. You can do this by including a preview of what you share on Facebook and Twitter, with a link to your Instagram bio for more. In order to see all the posts you’ve liked in one place, go to your profile and tap the options button. This is a gear if you have an iPhone/iPad and three dots on Android. Then tap “Posts You’ve Liked”. If you want to unlike a post without the user knowing, simply tap on that post and deselect the “Like” button. If you’re really nosy, errr curious, you can view what your friends have lLiked and commented on. To view their activity, tap the heart at the bottom of the home screen that shows who has Liked your photos. 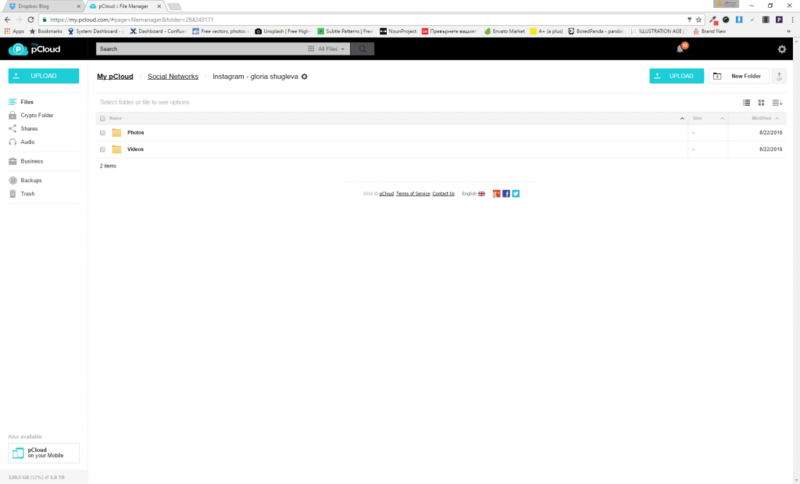 Then choose the tab at the top of the screen that says “Following”, and you can view their activity. From time to time you’d like to clear your search history. Well, you’re in luck. Here’s how you do it. Go to your profile and tap “Options”. 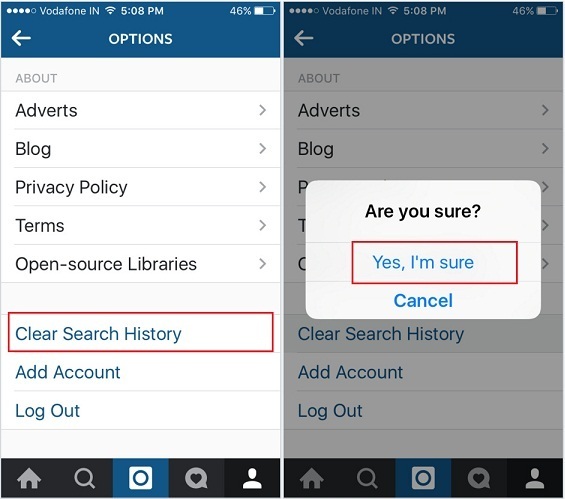 Scroll down and tap “Clear Search History” followed by “Yes, I’m sure”. Don’t you just hate it whenever someone posts a photo in which they are perfectly, casually posed, and you appear to be cross-eyed and have drool coming out of your mouth? Fear no more. 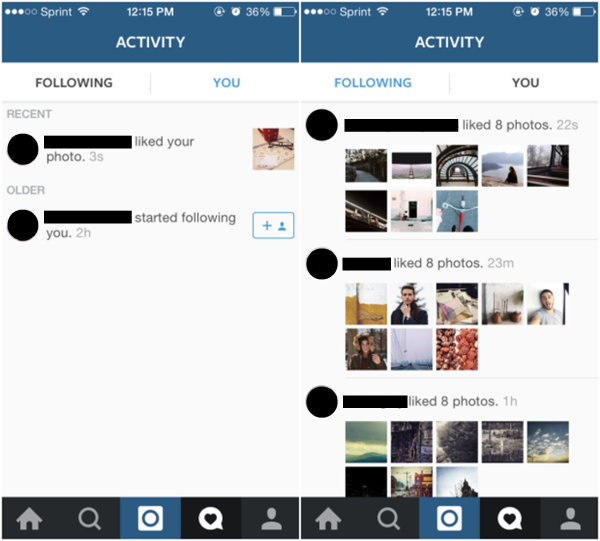 When someone tags you in a photo or video on Instagram, it is automatically added to “Photos of You” in your profile. But you can change that. To see what you’ve been tagged in, go to your profile and tap on the person icon on the bottom right of the screen. Then tap on the “Photos of You” button (it is the last one on the right under your Profile Picture). 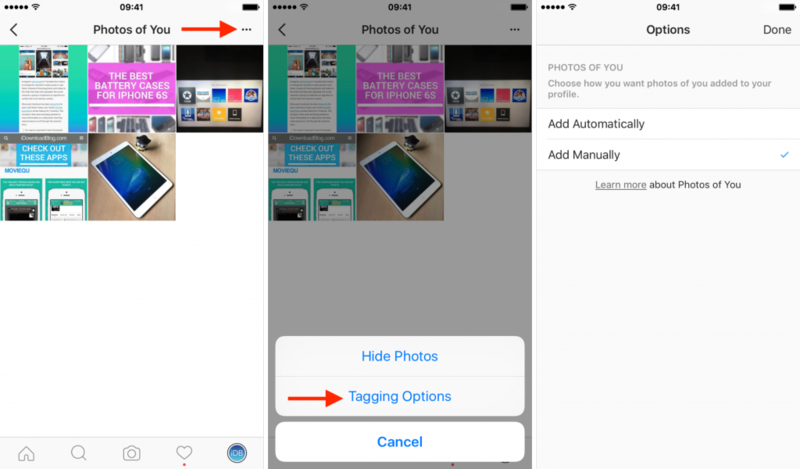 To remove tags from photos you want to hide, tap the three dots on the top right of the screen then tap “Hide Photos”. Checkmark all the photos you want to hide, and once you’re finished tap “Hide Photos”. Success! To avoid having unwanted photos of you in your profile, you can adjust your settings so that you have to approve a photo you’re tagged in before it is added to your profile. To change your settings to allow you to manually add tags, go to your profile. tap the “Photos of You” icon, tap the three dots, then tap “Tagging Options”. There you choose “Add Manually”. 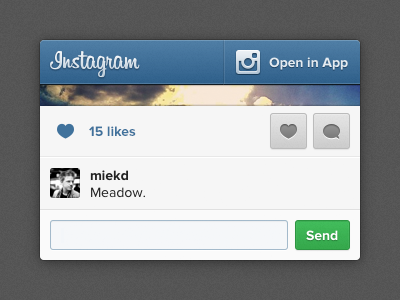 You will still receive notifications when you are tagged in a photo. To add a photo you’re tagged into your Profile, tap on the photo you were tagged in, tap your username, and select “Show On My Profile”. If you do not want to add the photo to your Profile, choose “Hide From My Profile” instead. 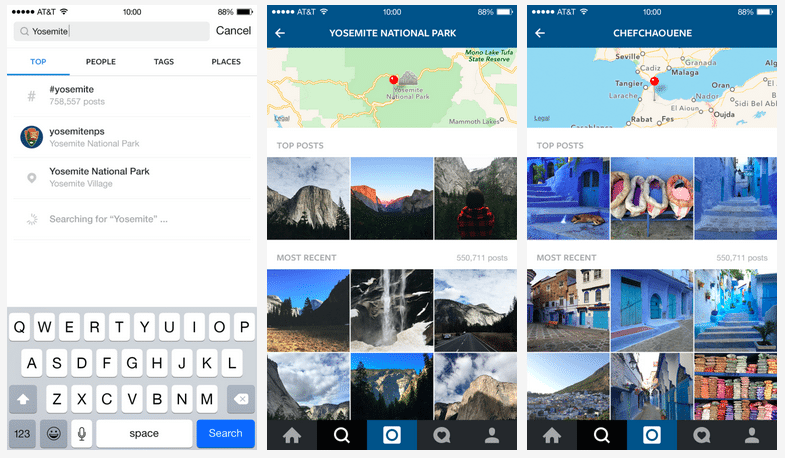 To browse photos taken in a specific town or city, enter that place in the search field. To view photos taken in a specific place, tap the magnifying glass on your Home page, which will take you to the general search. Tap on the Search bar and four tabs will appear. 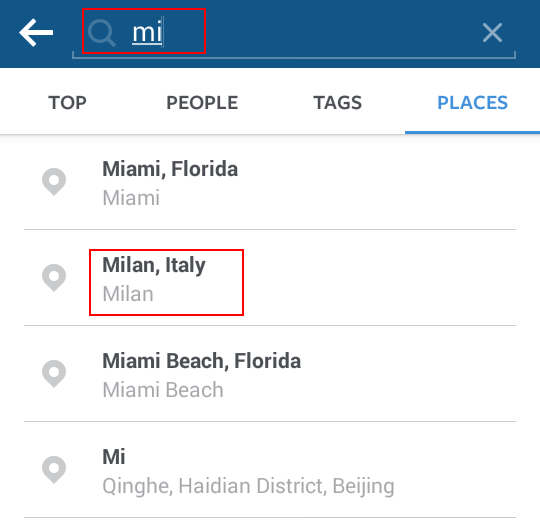 Tap on “Places” then type in the place you want to search for. You’ll be able to see all the recent pics that were geotagged there. Another option is to see photos taken near you by tapping “Near Current Location” once you’ve chosen “Places”. This is a great way to increase traffic to your Instagram posts and add Followers as well. Didn’t know it was possible? Let us tell you how. It can be time-consuming to find new accounts to interact with and gain traction on Instagram. One easy way to do this is to tap on a person you follow. Next to the word “Following” in green, tap the drop-down arrow. That will give you suggestions of people to follow similar to the user you tapped on. While these are some of our favorites, there are many hacks we didn’t get to. If you implement these simple hacks and techniques, you can easily increase your effectiveness on Instagram.